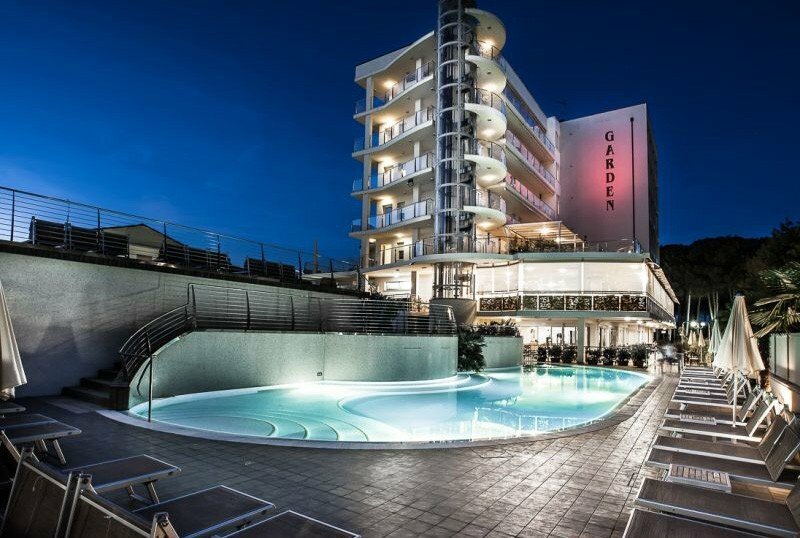 The Garden Hotel is a family-run 4-star hotel in Pinarella di Cervia. The property is located on the seafront, overlooking the pine grove. In addition to parking, WI-FI and air conditioning, it offers swimming pools with hydromassage, private beach, garden and entertainment service for children. Accept animals of all sizes. The hotel is located in a quiet and accessible area of Pinarella di Cervia, part of the Municipality of Cervia (RA). The structure overlooks the pine grove of Pinarella which separates it from the beach, just a few steps away. The center is a 10-minute walk away. All rooms are equipped with private bathroom with shower cubicle and hairdryer, adjustable air conditioning, informational 40 "monitor with WI-FI, mini-bar with drinks included, satellite TV and digital TV, safe, telephone and balcony furnished with shading curtain, drying rack, small armchairs and table.The hotel also offers the possibility of staying in the 3-star annex building 20 meters from the hotel, making use of all the services of the main building. Beach towels are included in the price. CLASSIC : for 1 or 2 people, with the possibility of adding a cot. They have a balcony with a side view. AMBRA : has a double bed or two single beds. The rooms on the top floor have balconies overlooking the sea, while those on the first floor and subsequent floors offer views of the pine grove (sea side) or side (south side). TOPAZIO : rooms suitable for up to 5 people, have a double bed with a third bed (bunk bed or bunk bed) with safety rails "sleep peacefully". Moreover, it is possible to add a short net of about 170-180 cm or cot / travel cot. These rooms all have a balcony with a side or pine grove view. GOLD : rooms suitable for up to 4 people. In addition to the facilities already listed, they all have a balcony with a side view. GOLD PLUS : can accommodate up to 5 people. All equipped with large terrace furnished with gazebo, green area, sitting area with armchairs and chaise longue, sun loungers, exercise bike. There are two types of rooms, both with all the facilities in the hotel rooms. SIMPLE : for 1 or 2 people, they do not have a balcony. IVORY : up to 6 people with additional bed, bunk bed and / or short net. They are all equipped with a small balcony and some with private services on request also accessible to the disabled. Garden, swimming pool and sun terrace. Inside it has a relaxation area overlooking the garden, a large dining room with panoramic windows and a reading room with newspapers for consultation. At guests' disposal bicycles with seats and "Shangri La" bar cafeteria service available 24 hours a day. The staff organizes theme nights with shows and juggling. PARKING : free and covered, limited places. AGREEMENTS : amusement parks, organized excursions (canoeing to the salt pans of Cervia with guide, boat trip, natural park, Butterfly House). PETS : allowed in all sizes. BREAKFAST : international, served at the bar until 11 am with a rich sweet and savory buffet, including pies, ring-shaped cake, biscuits, bread, savory pies, and special corner for freshly prepared crepes and omelettes. There is also a wide selection of hot and cold drinks such as coffee, cappuccino, centrifuged and fresh fruit extracts. LUNCH AND DINNER : the chef offers a wide selection of dishes based on Romagna and national cuisine with meat and fish dishes and table service (4 first and 4 second courses of your choice), vegetable buffet and delicatessen buffet with pastry made in home. Water, wine and canned drinks included. CHANGES : the menu is suitable for vegetarians and gluten-free dishes are prepared for those suffering from celiac disease. Restaurant times are flexible. In the hotel : strollers, bike seats, outdoor playground area, TV room with cartoons, "Pantera Rosa" children's area where there are entertainers who organize games and recreational activities. Every week evenings with magic, music and circus shows and, on request, babysitting service at an extra cost. In case medical care is needed, the hotel provides a small emergency room pharmacy and home visit by the doctor or pediatrician (both for a fee). In the room : cradles, cots (60x115), side rails for single and / or bunk beds, stringers in oilcloth, baby bath, potty for the night and bottle warmer. At meals : meals at flexible times, children's menus, high chairs, crockery, bibs and, for very small children during weaning, mothers can request baby food, vegetable broths and vegetable purée. Afternoon snack. On the beach : the bathing establishment "Le Lido" has a playground with slides, houses, swings, elastic nets, inflatable, table tennis, table football and a changing room cabin. The beach entertainment service offers activities for both children and adults. The structure has 2 swimming pools, one raised with hydromassage (40 sqm and 90 cm high) and one of 140 sqm with different depths (from 20 to 140 cm), also suitable for children who can play and have fun with the waterfalls. Around is the sun terrace equipped with beach umbrella and sunbeds and a "mise en forme" corner. 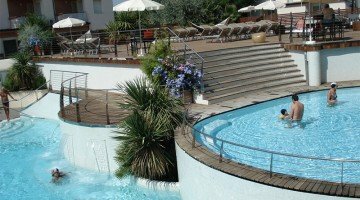 The hotel offers a beach umbrella and two sunbeds per room at the Le Lidò private beach in a standard area. Prices are per person per day in All Inclusive for a minimum stay of 3 days in a double room. TOURIST TAX: not included (to be applied only for the first 7 consecutive nights, from May to September, exempt children under 14). ALL INCLUSIVE: Full board + drinks with meals (wine, water) + cafeteria, aperitif, drinks (all day, at the bar of the structure) + Beach Service (1 umbrella + 2 beds per room). - If you can not come on holiday you do not lose the deposit, you can take advantage of the amount of the deposit for a stay at all our hotels, residences and apartments during the summer 2019 or even in the following years. Offer Children FREE up to 18 years throughout the summer. Last minute: spend Easter at the beach and enjoy the beautiful Kite Festival. The Hotel Garden offers you accommodation only in a hotel starting from € 80.00 per room, € 70.00 per room per room for 2/3/4 people. 10% discount at the Beach Restaurant "Le Lido". Ambra Room (in Hotel) € 63 instead of € 77, booking by 08 May 2019! On the occasion of the bridge on April 25th, enjoy the sea of Pinarella to see the Kite Festival! Possibility to have lunch at the beach restaurant "Le Lido" with a 10% discount on the list price. Easter weekend at the beach in Pinarella to see the Kite Festival! Offer for the Ivory Room (Depandance 3 *** at 20mt from the Hotel) in All Inclusive formula € 51 per person instead of € 71. Amber Room (in Hotel) € 62 instead of € 77, booking by May 8, 2019! Easter in Cervia with the Kite Festival! This year the Kite Festival will take place during the Easter weekend. The Hotel Garden offers you accommodation only in a hotel starting from € 80.00 per room, in an annex € 70.00 per room for 2/3/4 people. Topazio Room (in Hotel) € .1494 instead of € .2148, booking by 08/05 // 19. In Amber Room (in Hotel) € .87 instead of € .113, with reservation within 08/05/2019! Possibility to buy tickets for Mirabilandia directly at the hotel at a reduced rate. The park is just 17km away from the Garden Hotel. Full board € .90,50 instead of € .124 in tip. Ivory with booking by 08.05.